It has been happening for quite some time, but no one has been paying much attention: Western academia, mainstream media, and the most visible propagandists, were trying to convince the world that 1) ideology has died, or at least became irrelevant 2) in case it did not die, the Left is actually… hold your breath… right-wing! Especially the Left that is holding power, particularly in Asia and in Latin America, is being "re-defined" in London, Paris and Washington. The Western propaganda gurus are apparently rejuvenated, lately, as there are great budgets available to them, in the United States, United Kingdom, and elsewhere. They are openly told to go after certain countries, particularly Russia, China and Iran. Philosophy and such deep and essential topics like "in what direction the world should be evolving", are not discussed at UNESCO meetings, anymore, as they are not debated by talk show hosts and "public intellectuals", at least not in open. Light pop music, horror movies, the promotion of selfish, often infantile values and desires, never really deeply satisfied the masses, but they damaged them, reducing people&apos;s ability to think freely, to analyze and to make sober and well-informed conclusions. "-isms" have been spat at, particularly the left-wing "-isms". Increasingly, the left was smeared and then compared to the extreme right, even with fascism. In fact, pronouncing Communism and fascism in one breath, became tremendously well rewarded. In the West, thousands of "thinkers" and ideologues made a great living doing nothing else than that. This essay has been inspired by an exchange with an Irish academic, who called, in his email to me, this publication (NEO - New Eastern Outlook), an "extreme right-wing Russian nationalist publication". The biggest problem is that a great majority of Western citizens have succumbed to this propaganda. They are not capable of questioning anything related to these issues, anymore, and were they to want to question, they don&apos;t even know where to search for the sources that could effectively challenge the official dogma. They are indoctrinated, but they think that they are free. Not only that, they don&apos;t realize that they are deeply conditioned and brainwashed: they actually think that they are in a position to preach, obliged to enlighten others, instructing the world with what they have been taught. And so, they speak and write, get paid for it. They join the U.N., "international cultural institutions" and the NGOs, universities, and they continue spreading all those dogmas developed by the Western ideologues for one and the only purpose: to exploit and to control the world. They do not present these fabrications as theses, but as facts. Of course, there are no facts behind what they are preaching, as there is no hard evidence, but who would search for the evidence, and how? Even the internet is not so easy to navigate, anymore, and Western bookstores are nowhere as diverse as those in China or Russia. For instance, when the left-wing governor of Jakarta, "Ahok", began cleaning the most polluted city on Earth, building public transportation, providing the poor with social housing, several Indonesian NGOs paid by the West, as well as countless individuals, began calling "Ahok” a "right-winger", because he was evicting petite capitalist street vendors and thugs who were shamelessly blocking the few sidewalks that the turbo-capitalist Jakarta has in its possession. Thugs and street vendors, who flourished during the fascist, anti-Communist dictatorship, have been terrorizing the city and its mainly poor dwellers for decades. But the argument went: “The Governor is against the little people”. There was actually a "great danger" that this deeply popular governor could make it to a much higher post, even the highest one in the country. That would be unacceptable, and the servile "city planners", academics and "civil society" groups shamelessly teamed up against him. First, he was discredited (being called right-wing), then accused of insulting religion (Islam) and finally, thrown into prison. He is rotting there until now, for being a true socialist (a word that is even still illegal to pronounce in Indonesia, as it is being connected with Communism). The Jakarta scenario is of course no exception. The same is happening in the Philippines. The West and its local lackeys are attacking, with the same twisted "logic" and zeal, countries such as Venezuela, Brazil, but especially China, Iran and Russia. To call China by what it really is: "Communist (with the Chinese characteristics) and presently the most successful country on Earth”, would be totally unacceptable, anywhere in the West or its "client" states. That would greatly boost China&apos;s popularity. Why? Because even deep in the dark belly of the capitalist and imperialist beast - Europe and North America - the common people actually want something "left-wing", something socialist, even Communist. They were told to hate it, to trash it publicly, and they do. But deep inside, many are still longing for it. The Empire knows psychological warfare extremely well: to discredit China, it really has to be called capitalist. Or call it imperialist. Say it is "like us". (“Like us” is definitely not good. The people on all continents hate "us"). Say that China is not helping African people by building infrastructure, hospitals and schools (although that is precisely what China is doing, if you ask Africans - something that no Western journo is bothering to do). Say that China is "following its own interests", and that it is doing business (again, these days, a dirty word, except in a few Southeast Asian helplessly corrupt and servile "client" states). The same is true when it comes to Russia. The foreign policy of Russia is clearly anti-imperialist. In many ways, it is still that good old Soviet foreign policy - internationalist, egalitarian, based on humanism. Present-day Russian diplomats are brilliant, soft-spoken philosophers. The West can never match them. Therefore, it smears them, their country and everything that it stands for. President Putin is portrayed as some right-wing strongman and lunatic, and Russia as a capitalist state. It is thorough nonsense, as Russia is in many ways, increasingly, similar to its close ally - China. Russia counts on a mixed economy with a great accent on social welfare, and it is a country that is ready to defend and protect those who are brutalized by Western neo-colonialism. It occupies nobody, overthrows no governments. It is increasingly a good, solid and compassionate country, but the more it is, the more demonized it gets. The better it behaves, the more it gets smeared, mostly by being called "capitalist", "right-wing", an "oligarchy". Well, great propaganda barks for sure; the Western demagogues and intelligence officers certainly know their trade. Syria, oh how is it being defined by the Western demagogues? How it is being defamed! It is never called by what it really has been for decades - a Pan-Arab socialist state! It&apos;s "regime" (a favorite British derogatory term, which I actually love to use against their own, British fascist, stale, passive-aggressive monarchy) is constantly branded as "dictatorial". You will never hear expressions like "socialist" or "internationalist". You know why? Because, let me repeat it again, these terms, deep inside, evoke sympathy in the ears of people worldwide, even in the hearts of some Westerners, subconsciously. "Socialist", "serving the people" - you may smear it, but that is what people really want, and wanted for decades and centuries. That is what they have fought for, were dying for; on the barricades. Some instincts are still there, in people&apos;s hearts, or do you think that they were sacrificing their lives in order to be governed by individuals like Macron or May? Therefore, the socialists, not some European pseudo-traitors-socialists, but true socialists and Communists, are constantly branded by the West as "populists", demagogues and often, even as right-wingers. 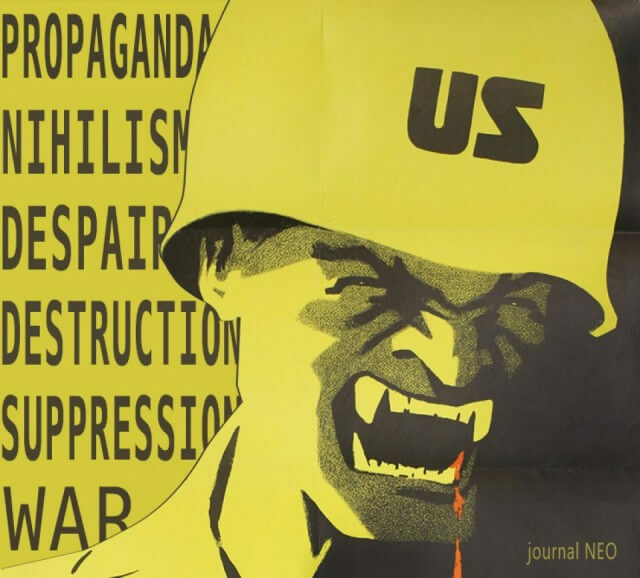 Now the people, at least those who are the most exposed to the Western mass media, are "unable to commit themselves" to anything, from political labels, to revolutionary ideals, and even to each other. They go "by issues", arrogantly selfish (hundreds of millions of atomized centers of the universe) in both personal lives and in politics. In London or Paris, not to speak of New York City, those who are believed to be the "most educated", are sadly the most conditioned, indoctrinated and feeble. It is quite remarkable that in some parts of the world like Southeast Asia, the West has managed to create an absolutely bizarre West-lookalike-but-not-really-alike "upper class", by injecting an idiotic type of education and cheap "cultural values" (I will address this issue soon, in my upcoming essay). The result is - obedient and soulless countries unable to create anything new and substantial. All of this, just in order to prevent the world from following its instincts - from choosing socialism and Communism. In Africa - precisely the same. It began with Patrice Lumumba and his murder, and it never stopped. Fascist monsters and mentally sick individuals were injected from abroad, and paid to govern. Asia? Absolute horror: from the socialist Iran in 1950&apos;s to internationalist, Communist Indonesia before 1965, people wanted Communism and got murdered, raped and in the end, robbed of everything. By whom: by the West and its apparatchiks and local spooks from the colonial era. Countries that resisted and won, like China, and Vietnam, are now much better off than others. They all wanted socialism, all over the world: The Middle East, too, and yes, Europe as well! It truly takes great discipline and continuous brainwashing, to forget that the US and UK intelligence services prevented Europeans in France, Italy and even West Germany, from voting in Communists after WWII. Nazis were employed to intimidate and to murder left-wing candidates. Then they were shipped to South America, where they either "retired", or began collaborating with the fascist pro-Western regimes. I know it: I spoke, couple of decades ago, to those old beasts who were allowed to escape with their loot of gold teeth from the concentration camps - to Paraguay, Argentina, Chile. Destroying the natural human longing for socialism is the main task of the Western regimes, be they "constitutional monarchies" or "guided multi-party hoaxes". What did they do to people, really? Adults, fathers and mothers, "respected" individuals are moving their fingers all over the phone monitors, playing infantile games and making babyish faces, while taking their own photographs at every corner. European intellectual cinema has collapsed, as well as literature. And everyone is grinning like idiots. And almost everyone is suicidal. This insanity which the West has spread, just so its dear capitalism and neo-colonialism stays in control of the planet, will not last much longer. Soon, I am sure the world will rise and demand the truth! With the truth, the psychological balance will return. People will learn how to dream again. With dreams, the insanity that the West has been spreading, will be confronted. Imperialism will shout, howl; it will try to bite everything that moves, but relatively quickly, it will lose all its power and, hopefully, kick the bucket. I believe in it. Millions are now, again, ready to fight for it.